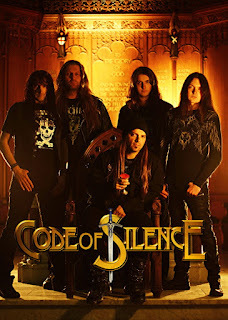 British Melodic Metallers Code Of Silence, fronted by Brazilian vocalist Gus Monsanto (Timo Tolkki’s Revolution Renaissance / Adagio / Symbolica / Lord Of Mushrooms), have signed with Mausoleum Records and Rubicon Music. 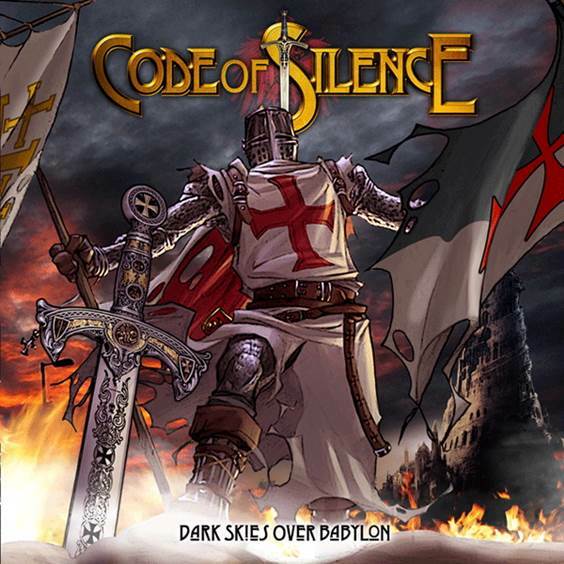 Produced by Paul Logue (Eden’s Curse) and mixed and mastered by Italian hot shot producer Alessandro Del Vecchio (Eden’s Curse / Hardline / Lionville) the band’s debut album “Dark Skies Over Babylon” is a grandiose thematic album based upon the tales of the legendary Knights Templar during the period of the Crusades. The album is scheduled for release on January 23 in Japan, February 25 in Europe and April 9 in North America. The band also filmed a promotional video for their first single “Sky Is Falling Down” in early December 2012 in Glasgow with Mycho Films, which is due to be premiered in Spring 2013. Alongside the experienced Monsanto, the band features young virtuoso guitarist Ben Randall (Power Quest) who turned heads when he won “The Most Promising Young Guitarist” award at the 2008 inaugural Guitar Idol competition in London at just 17 years old. With a field of over 750 international entrants, Randall wowed judges who commented on “his level of technical virtuosity at such a young age, coupled with a level of phrasing beyond his years”, a hallmark of his playing throughout the Code Of Silence debut. The rest of the band consists of Keyboardist Scott McLean (Falloch / Concept Of Time), Drummer John Clelland (The Crows / The Jack / Karma / The Troubleshooters), Bassist and band leader James Murray.